The importance of appropriate housing when keeping pet reptiles cannot be underestimated in terms of maintaining good health and vitality. Understanding housing design according to each species exact requirements is vital to successfully replicate conditions in the wild. In this webinar, we will explore the importance of housing design and advise on the best heating, lighting and other equipment necessary to keep pet reptiles. 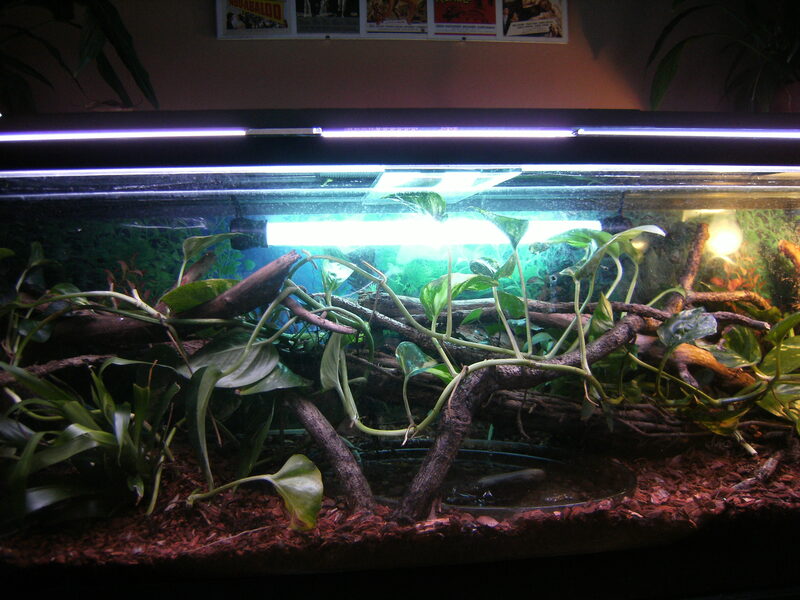 There will be a debate on naturalistic vivarium styles versus more clinical or intensive husbandry systems and how these factors can impact health as well as disease transmission. Common pitfalls to avoid will be identified, and some common husbandry advice frequently given for certain species will be analysed in depth. 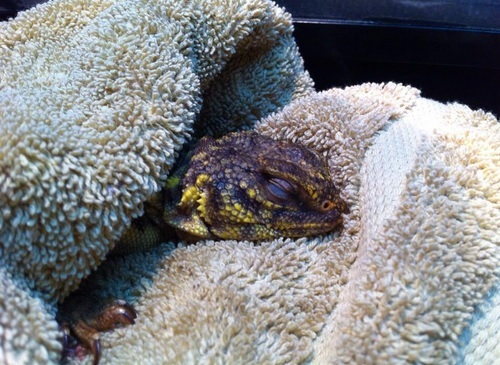 In this webinar we will run through the top 5 clinical problems encountered when working as a reptile vet. Signs of health and disease will be explored to equip the pet reptile keeper with better knowledge and allow them to know when to seek veterinary advice. This webinar will contain a lot of interesting case studies of my own patients following their stories from initial owner concerns through the diagnosis and treatments of each condition. This is a great chance to get ‘behind the scenes’ into the reptile vet clinic environment and improve your knowledge and practical skills on the topic of reptile health and disease. This webinar seeks to dispel the many myths and mistakes commonly encountered on the topic of keeping pet lizards. There will be a heavy focus on nutrition as well as how captive husbandry can affect nutritional status and disease. In particular, we will explore how artificial lighting has a huge impact on overall health, vitality and the issue of metabolic bone disease. 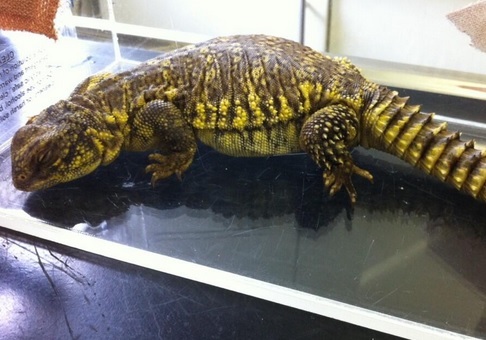 Similarly, we will try to clear up the confusion surrounding the use of supplements, as well as discussing in detail how to design appropriate diets for carnivorous, omnivorous and herbivorous lizard species. I always maintain that in order to keep insect-eating lizards successfully, one must understand and care for their insect prey just as enthusiastically. Join us in this exciting session to find out why. 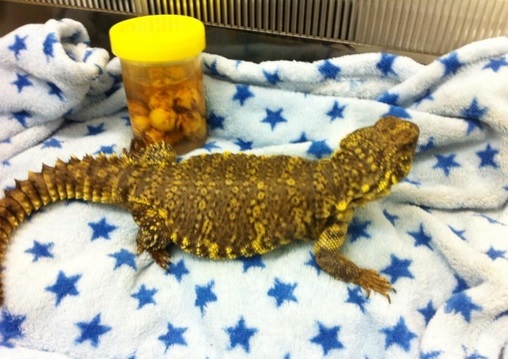 This Uromastyx lizard presented to me almost two weeks ago for constipation, having not defaecated in several days which was highly unusual for her. She was extremely bright and well, with a good appetite and no other changes in behaviour. 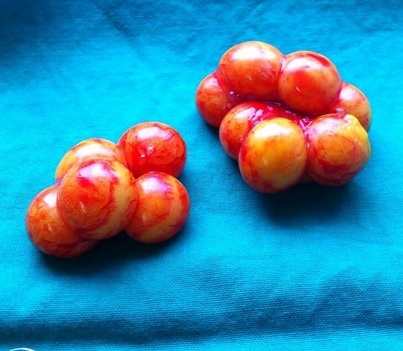 There was no obvious mass or obstruction on abdominal palpation which may have indicated a blockage, foreign body or tumour although her abdomen was quite distended. After discussion with the owner it was decided to trial conservative treatment by giving her a liquid paraffin enema and feeding her more at home on her food. Unfortunately as she was so stubborn and strong I failed to convince her to open her mouth to pass a stomach tube to give liquid paraffin directly. Strong little lizard! She came back several days later having still not passed any significant amount of faeces, so I decided to perform an X-ray to visualise her internal abdomen and find out what was wrong. The X-ray revealed that she was impacted with opaque white, gritty sand material visibly transversing the mid abdomen in her intestine. I was also quite suspicious of the large greyish spherical masses occupying her abdomen as they looked like they may have been ovarian follicles. I hospitalised her to allow me to pass liquid paraffin directly each day with the aid of some anaesthetic gas so I could open her mouth without causing undue stress or damage, and repeated the X-ray two days later. 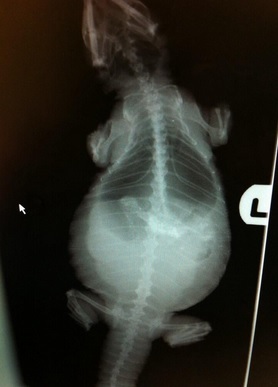 She had by now stopped eating and although she was still very lively we needed to know whether the impaction was resolving with medical management or would we need to be more aggressive with treatment. She had produced some small amounts of faeces whilst hospitalised so I knew it was a partial obstruction most likely rather than a complete blockage. I tested her faeces for parasites as sometimes intestinal worms can cause sluggish gut transit and impaction issues but she was negative for any parasites. The clinical picture didn’t fit very well though in that the impaction had not moved or progressed. It was in the same location and if anything appeared denser and more compact. More importantly, the abdomen itself was now less inflamed so gave a clearer view of the suspected follicles. It was decided to perform an exploratory surgery to spay her to treat the follicular issue as well as trying to sort out the impaction. Hopefully she will have no further reproductive problems now her ovaries have been removed. I say ‘hopefully’ as when spaying lizards there is always a small chance some ovarian cells could be left behind and regenerate. The anatomy means that it can be tricky to place ligatures between the ovaries and surrounding structures without causing damage or catching some ovarian tissue in the ligature itself. On one side of the abdomen the ovary lies in close proximity to a large vein and on the other the adrenal gland. So it is a technically challenging operation, but one that brings great satisfaction when it results in a successful outcome. 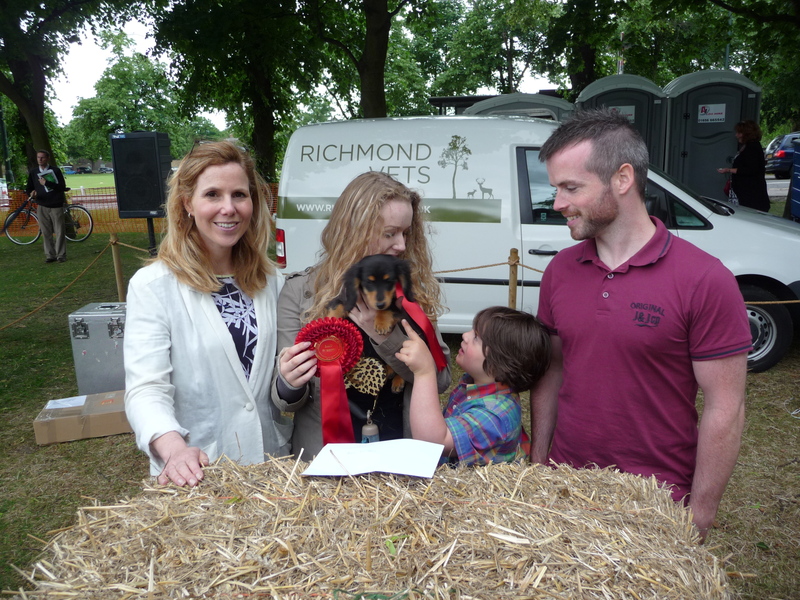 I will be judging a fun dog show sponsored by my practice Richmond Vets (www.richmondvets.co.uk), at Kew fete on Saturday June 21st 2014. Each year we have a celebrity judge who I will assist in their decision making. Last year I judged with Sally Phillips of Bridget ones, Smack the Pony and Miranda fame. This years celebrity judge is soon to be announced, a start of TV Soap land! And I may be bringing along a few animals also for show and tell to teach the kids about pets and nature. Last year I brought my new chickens and we had a competition to give them names, this year I’m thinking of bringing some frogs and salamanders and a client may be bringing a few rather more exotic creatures! Watch this space…..and would love to see you all there. 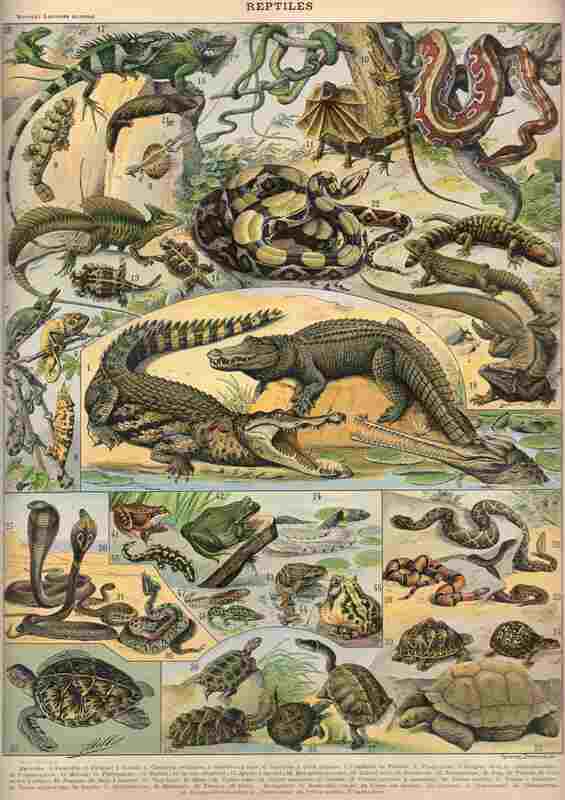 Many reptile keepers dread to hear the word ‘Crypto’ and for good reason, as this is a parasite which can have devastating consequences and wipe out entire collections of reptiles in severe cases. Cryptosporidium infections are found in a wide variety of reptile species, and can cause severe debilitation and death in many, whilst being a commensal or harmless gut organism in others. The parasite is a protozoan single celled organism with a direct life cycle meaning the host becomes reinfected very quickly with the next generation of eggs contained in faecal material. The importance of this life cycle mode is that infection can spread very rapidly throughout reptile collections unless very strict hygiene and disinfection protocols are put in place. Because some animals may be subclinical carriers with no visible symptoms, by the time an animal is identified as infected the organism may have spread to many others in a collection. Infection can be mild and only cause short term diarrhoea or can lead to severe chronic diarrhoea, wasting, anorexia, failure to thrive and even death. Other signs of disease sometimes occur such as inner ear infections, reproductive failures and secondary infections such as stomatitis associated with immune debilitation. 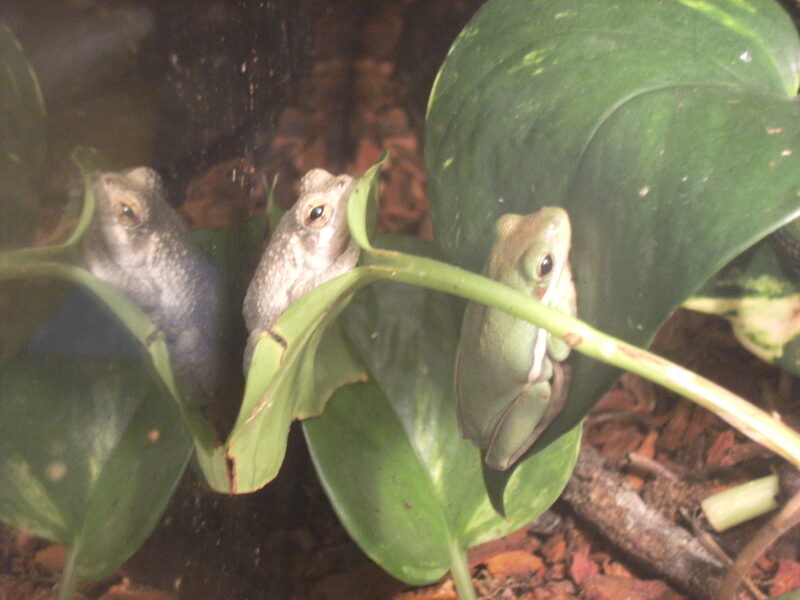 Cryptosporidia species infecting reptiles are not thought to be transmissible to humans, although we have two species that cause severe gastrointestinal illness of our own. 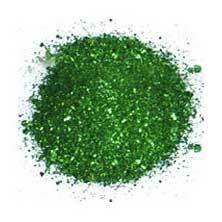 The first difficulty in treating this infection is that it is difficult to diagnose. Quite often it is impossible to detect on routine faecal analysis even with specialised staining techniques, hence the prefix ‘crypto-‘ meaning ‘hidden’. Many infected animals turn up negative on faecal tests as the parasite is an intermittent shedder, and can also exist in low numbers in the intestinal lining making it extremely easy to stay undetected. The other tests involve a PCR or ELISA test which detect the parasite DNA and are more sensitive but again this relies on the organism showing up in the sample to be tested. The only certain way to diagnose the parasite is on post mortem microscopic examination of sections of gut lining. The second reason it is problematic is that there are no treatments that are 100% reliable or effective. In fact, most reptiles that are showing clinical signs of cryptosporidiosis are already too debilitated to survive, and the treatments themselves may actually do more harm than good. Various treatments have been trialled including various classes of antibiotics, anti-parasitic drugs and even concentrated bovine serum preparations with limited success rates. 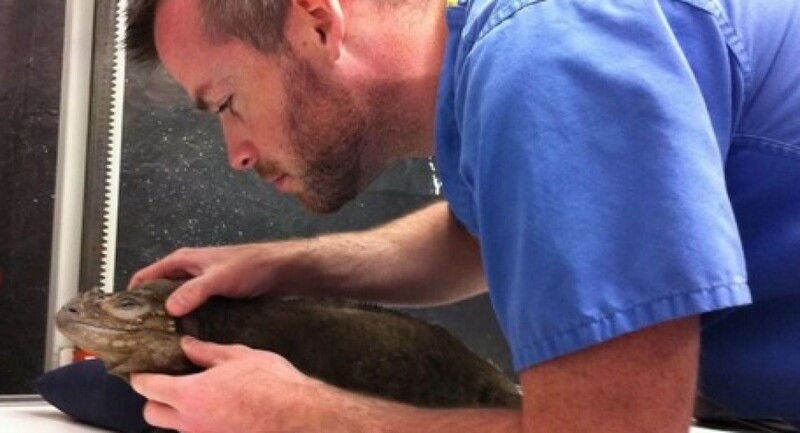 In some cases, and specifically in large collections it may be necessary to humanely euthanase infected individuals as their prognosis is so poor, in order to safeguard the remaining non-infected animals. Identifying infected versus non-infected individuals can however be challenging. For these reasons, it is vital that proper quarantine and isolation is carried out on new reptiles when adding to an existing collection. Strict hygiene practices that limit the spread of faecal contamination from one vivarium to the next will limit spread of infection. Particular caution must be taken with any wild-caught individuals, reptiles that are failing to thrive, or repeatedly refuse or regurgitate food, the latter being a common sign of infection in snakes. 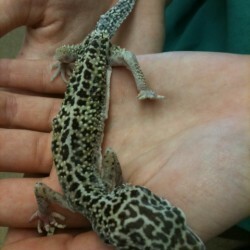 Leopard geckoes seem to be particularly vulnerable, although it is debatable whether this is due to genuine species susceptibility or due to the tendency towards large, intensive style husbandry conditions with many animals kept in close proximity at breeding facilities. Indeed, the biggest problems with Cryptosporidiosis in reptiles occur in large collections and breeding facilities so in these situaitions proper biosecurity measures and strict quarantine and testing policies should be put in place. If you have a reptile that is showing any of the symptoms such as diarrhoea, inappetance, anorexia, weight loss or general ill thrift it is always wise to consult a trusted and experienced reptile veterinarian. Several other diseases can mimic signs of infection ranging from heavy roundworm or pinworm burdens, liver disease and intestinal impactions to more serious internal or metabolic problems. A good reptile vet should be able to outline a clear diagnostic and treatment plan based on the specific history and presentation on a case by case basis.